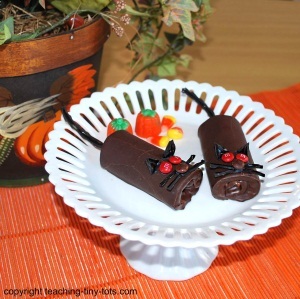 Toddler Recipes: Halloween Black Cats! Toddler Recipes: Here is a simple black cat to make that will add fun to any party table! A great way to add some fun to any party table. 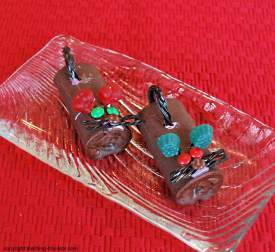 Dress up a HoHo or a chocolate-covered cream filled cake roll and decorate with some artfully arranged candies. Mini M and M's or small candy coated chocolates. Cut licorice pieces into one inch strips for whiskers. We used two pieces for each cat. Cut longer piece for tail. Put a dab of icing and center the whiskers on cake roll. We used two pieces. Place another dab of icing on center of whiskers and place mini m and m.
Put two dabs of icing using skewer where eyes are to be placed. Place mini m and m's on icing. For ears cut a triangle out of licorice twizzlers or use black gumdrops. Put a dab of frosting on the base of ears and place where desired. Poke with a skewer or toothpick in the back of hoho for tail. Insert licorice tail. Place on plate to set until dry. Wrap in a clear goodie bags and tie for individual treats or arrange on a plate as a centerpiece. Toddler recipes like this are easy to vary by changing the decorations. Use green and red gummy fruit ears and make some Christmas mice.